This is a jumbled mess, but its ambition helps it overcome its flaws. Despite feeling slightly disjointed, the ensemble cast is handled surprisingly well and all of the storylines come together quite naturally. Tom Tykwer and The Wachowskis have created a deeply moving, visually engaging picture that will keep the viewer thinking long after the credits finish rolling. A decent adaptation of a great book. Would be better served being a series - the base material is just too extensive to cover in a single feature film (even as lengthy one). Using only one actor for several roles, the astoundingly successful efforts (mainly due to great makeup and acting) notwithstanding, was overused and amounted to breaching the fourth wall on numerous occasions. Terribly dull and ostentatious. An overly-ambitious mess. The ideas are either terribly stupid, blind and/or cliche or intellectual and insightful, but never clever or entertaining. It's a very matter of fact film, with some misguided self-righteousness, like having a one way conversation with an autistic child. It's not enjoyable to have your mind randomly go from one story to the next and back, it's unpleasant. 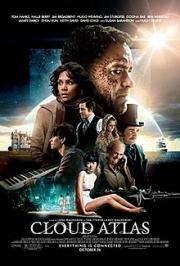 Cloud Atlas is an exhausting and frustrating melodrama. Although ambitious in its aims, the overwhelming plot and inconsistent tone results in this epic reaching for the stars only to fumble on its own feet. I enjoyed every moment of this movie. My feeling of this movie is that I don't really want to watch it again, yet I feel like I need to in order to understand it. There are so many ideas in the movie, but none are entirely fleshed out. There are ideas about reincarnation, how our lives and actions influence the future, that love never dies, and a critique of the idea of order that results in the subjugation of others. Also for love being one of the themes, emotion seemed lacking. I can't say I liked it, but I didn't dislike it. Nov 18, 2018 Iulius E. S.